A new statue in the College chapel has been dedicated at a special service today (Tuesday 24 June) to mark the feast of the Birth of St John the Baptist, the Chapel’s Patronal Festival. The statue, a Madonna & Child (Our Lady, Seat of Wisdom), was created by the renowned English sculptor Peter Eugene Ball, who has created religious work for churches and cathedrals throughout the country, in a career spanning more than 50 years. It has been given to the College to celebrate our 750th anniversary year; the College is grateful to John Booth (1976) for this generous gift. 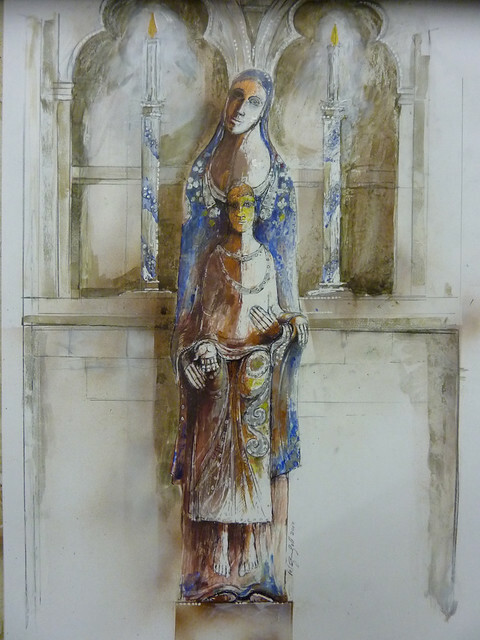 "I was first approached by Revd Dr Simon Jones, Chaplain of Merton College, in April 2013; he invited me to visit Oxford with a view to making a Madonna and Child for the Chapel. Simon was keen to create a space where students could find a focus for their thoughts and prayers, away from the main body of the Chapel, and one corner of the Ante-Chapel, glorying in a beautiful medieval piscina, seemed to lend itself to this purpose. "We felt the piscina provided an exquisite backdrop for a devotional sculpture and I began to envisage a Madonna and Child with medieval references but which was in no way a pastiche—rather my own interpretation. I wanted it to reflect some of the architectural features of the piscina and also to relate to other parts of the chapel—it is always my intention that the sculpture should settle effortlessly into the space in which it finds itself and quickly become part of the fabric of the building. Most importantly, I wanted to be able to imbue it with an intense devotional quality with which students could identify and use as a focus for thought and prayer. "I started the piece in December 2013 and over the next six months spent a few hours each day working on it. Both the Madonna and Christ Child are made from a South American hardwood, partially covered in copper and embellished with some solid silver and gold leaf. The Madonna is coloured in an ultramarine hue while the Christ Child is of a russet brown and the finished sculpture stands approximately 4½ feet high. Two large candlesticks, echoing the colour and decoration of the Madonna, have also been made to stand inside the piscina, either side of the sculpture. "Having now installed the Madonna on its new plinth, and placed the candlesticks inside the piscina, the result goes a long way towards realising the original plans—the eventual addition of a pricket stand with its flickering candlelight will, I feel, complete the vision." The Bishop of Chichester, Dr Martin Warner, dedicated the statue at a special service of Choral Evensong, and the College Choir gave the first performance of 'Salve sedes sapientiae' by Matthew Martin, one of the commissions for the Merton Choirbook.